The Residence, by Kate Anderson Brower, is an extraordinary portrait of the butlers, maids, plumbers, and chefs who run the “home” half of the White House. The book is crafted from over 100 interviews, and takes readers to the tragic day Jackie Kennedy returned home in a blood-soaked dress, what Richard Nixon did after resigning, and what it’s like to walk in on naked presidents. The result is a mesmerizing history of America from the service staff’s heretofore untold point of view. A comprehensive list of the fascinating details revealed by Brower would require reprinting the book in its entirety; here's a tiny sampling of things we learned from The Residence. 1. It takes a large staff to care for the White House. The White House is bigger than you think. Within the building, according to Brower, “132 rooms, 147 windows, 28 fireplaces, 8 staircases, and 3 elevators are spread across the 6 floors—plus two hidden mezzanine levels—all tucked within what appears to be a three-story building.” Ninety-six people work full-time in the residence, and there are another 250 part-time employees. Among the jobs they do: butler, maid, chef, plumber, doorman, and florist. The second and third floors of the White House make up the residence. 2. “Devotion” is the service staff’s watchword. Members of the service staff pride themselves on being able to melt into the walls, remaining simultaneously attentive and unobtrusive. Things like bed turndown, vacuumed carpet, and painted walls happen as if by magic, carefully choreographed around the first family’s schedule. World-class parties can be thrown with a moment’s notice. A shirt removed when the president steps into the shower has vanished for laundering by the time he gets out. 3. Intimate conditions sometimes lead to embarrassing moments. 4. Open positions are not advertised. Don’t bother checking the classified ads for job openings. 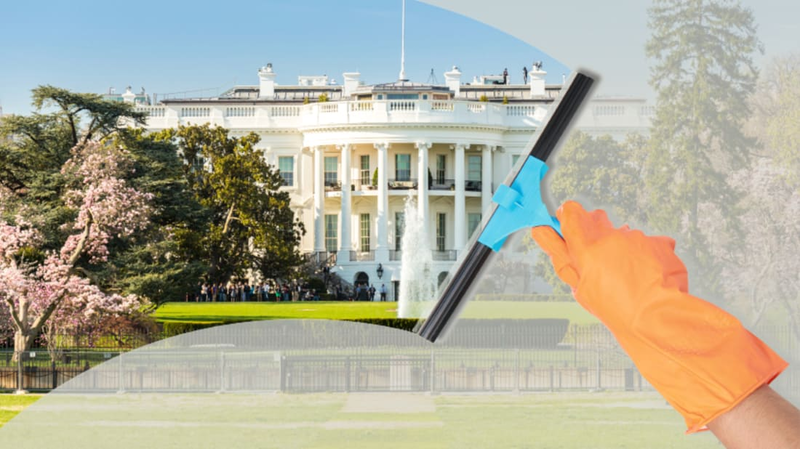 Available positions on the White House residential staff are filled by word of mouth, with employees bringing in, and vouching for, new hires. Multiple generations of families sometimes work in “the house,” as they call it, and employees generally stay on for decades. 5. The White House chefs are the best in the world. 6. They refill drinks, fix the plumbing, and find terrorists. The Secret Service isn’t the only group handling security. The White House maid staff is trained to be alert for signs of unusual activity that might endanger the first family. In 2011, a maid discovered a broken window and piece of broken concrete on the Truman Balcony. An FBI investigation stemmed from the discovery. What the Secret Service had previously dismissed as a gang shooting unrelated to presidential security turned out to be seven shots fired directly at the White House. 7. Presidential transitions are their Super Bowl. When a new president is elected, he or she takes ownership of the White House at 12:00 on Inauguration Day. Until the stroke of noon, however, the residential staff gives the outgoing president the same level of service as any other day. While everyone is at the Inauguration, the service staff has six hours to transform the White House for its new occupants. It is a massive endeavor requiring the presence of every member of the staff. All of the outgoing family’s belongings are packed and all of the incoming family’s belongings unpacked. When the new president arrives at his or her new home, the mansion is redecorated; rugs, headboards, and mattresses changed; new flowers arranged; paintings replaced; clothes hung; and toothbrush set out. When the outgoing president departed his or her family photographs are hanging on the wall. When the new president arrives, his or her family photos are there. 8. They don’t come cheap, and the president has to pay for it all. 9. The president’s food is serious business. 10. They work in a museum. White House curators keep track of “every candlestick and side table.” Furniture and artwork are irreplaceable, which sometimes complicates living arrangements and public events. “You’re working in a museum,” said one member of the service staff. Moving things around for television cameras isn’t as easy as one might think. “It’s not just two chairs for an interview,” but “two chairs in the Blue Room that are older than you are—by centuries—that need to be moved out of the way.” Accordingly, specific members of the staff handle such changes. What is not on display at the White House is stored at a warehouse in Riverdale, Md. 11. With every new family, they must relearn their jobs. Presidents come and go, but the service staff remains the same. After four or eight years, staff grow close to the first family, and tears are invariably shed when there’s a change in administration. When a new family comes in, a new vibe comes with them. Chefs must learn new palates, florists learn new tastes, and there’s a long stretch during which the incoming family must learn to adapt to a suddenly robust staff eager to attend to their every need. One White House usher in The Residence admitted that some first families are a pleasure to serve, and that with some they have to pretend. “But we pretend very well,” he said.